My mum, Katie, was a brilliant knitter and she would knit while on night shift as a Nurse at Gartnavel Hospital in Glasgow. She taught me how to knit and for years she would finish off necklines on jumpers I made. Many years ago, I think not that long before she passed away, my mum knitted a clown. Yes, that’s him above. She had never knitted a toy before, always jumpers and other amazing clothes. So it was a bit strange that she made him. But here was a knitted clown. Well I had him in a nice floral suitcase for years, he wasn’t my cup of tea at all. Then I had my little girl and when I happened upon the clown I could feel tears welling. 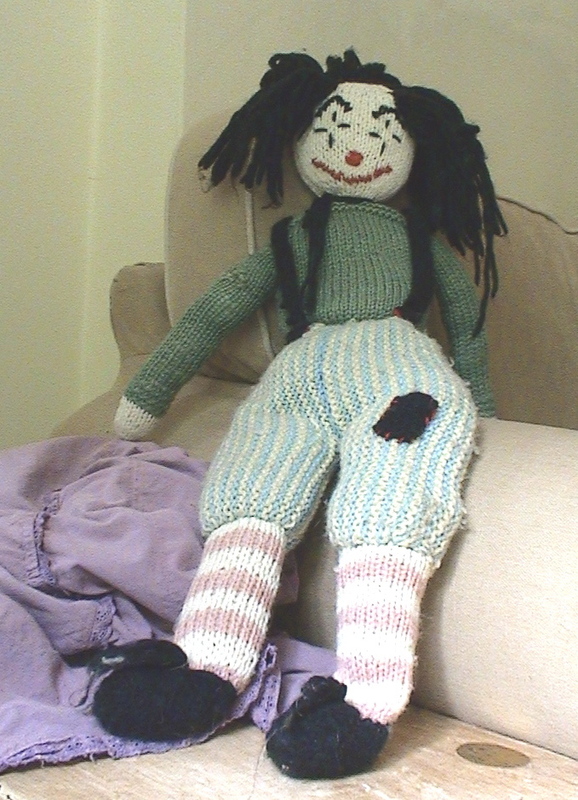 It seemed the clown my mum had knitted all those years ago was for her grand-daughter. And my girl loves this clown. He has been played with a lot and developed a tear in his arm, stitches unravelling. Plus, his head was prone to flopping about. So the other day I mended his arm, darning the hole and tightened and stitched his neck so that his head sits up better. He looks so much happier! Here is my mum’s clown, knitted over 20 years ago and still bringing joy. Thank you mum.